Despite this fact, there are a couple of new "features" that were added by way of a new packaged applications called Sample Reporting and Data Reporter. Let's take a look at Sample Reporting first. Upon initial inspection, this application seems quite unremarkable and basic, as it simply contains a few IRs and standard reports. However, after a closer look, it is obvious that there is more to this than what is on the surface. The first two - Interactive Report & Standard Report are nothing more than their titles imply, and I won't spend any more time discussing them in this post. The last three, however, do merit some additional attention. Filter Reports will seem very familiar to you, as this type of report has been implemented by a number of web sites. Basically, there is a list of filters on either the left side of in a drop down. Selecting a filter will, well, filter the report based on that criteria. Adding additional filters will OR each condition. The point behind Filter Reports is to enhance usability by reducing the number of options available. While IRs are great, they may be overwhelming and not intuitive enough for some users. Filter Reports solves this problem by presenting all of the available options right there on the page. Users need only click on what they want to see. It would not surprise me at all if Filter Reports were integrated into APEX 5.0, as I think that a lot of users will benefit from their more streamlined approach to mining data. 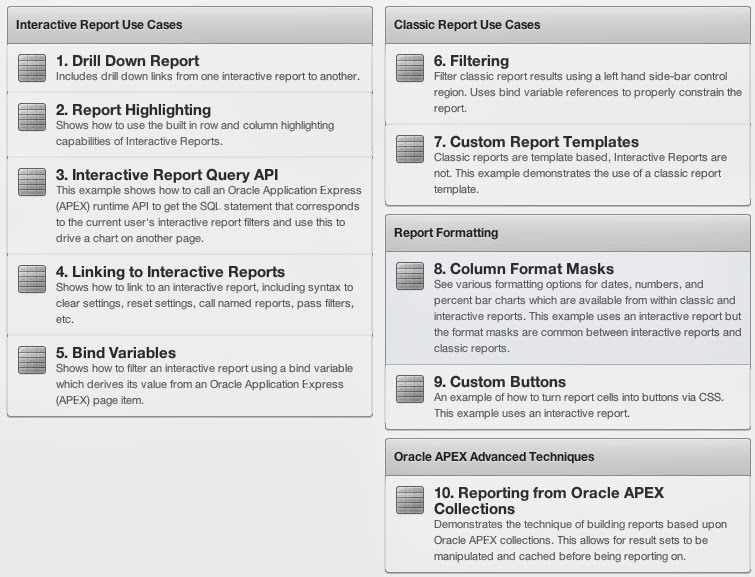 While some of these examples are simple, many of them provide clear and concise examples on how to take your APEX reports to the next level. 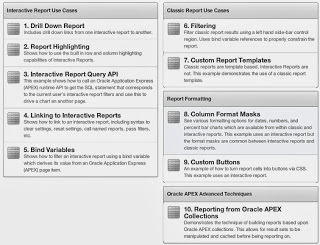 For example, the Custom Reports Template & Custom Buttons one illustrate how to easily change the look & feel of your reports to make them easier to use. Developers of all skill levels will be able to utilize these Use Cases as points of reference for their own projects. As APEX developers, we often forget about the pure power available to us in the database itself. 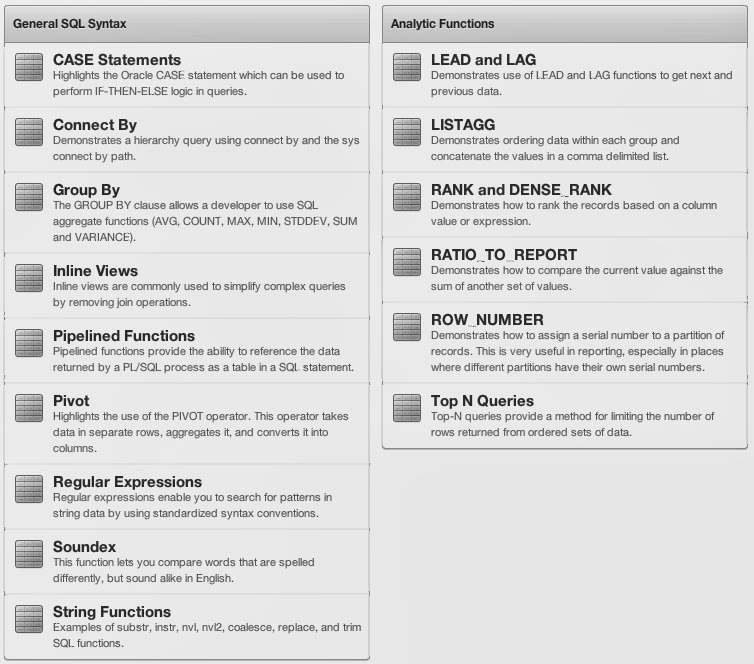 From advanced search techniques to analytic functions, the Oracle Database can provide a layer of functionally that is unsurpassed. 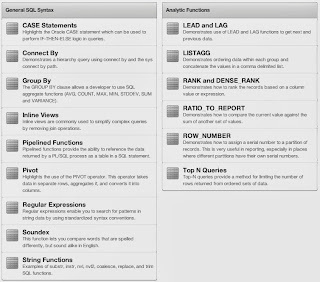 The SQL Examples section outlines some of these features. If nothing else, every APEX developer should have a look at these example and their corresponding SQL statements. At a minimum, they will serve as a refresher. But in most cases, most developers will learn a thing or two from these examples. APEX 4.2.3 is available now as a patch or as a fresh installation. If you don't want to upgrade your own instances, then head on over to apex.oracle.com, as it is running 4.2.3. Thanks for this Scott, it's all to easy to forget about the packaged apps!